Your support is essential to help ensure the final decision on leaving the EU comes back to the people. For just £10 you can help by becoming a Member of Cheltenham For Europe (we welcome Student Members for free) or by offering a further donation. Please spread the word on social media too – simply follow the links at the bottom of the page. Cheltenham For Europe is a cross-party, collaborative, pro-EU campaigning group. We are one of over 100 similar, fast-growing organisations in the UK affiliated with Britain for Europe. We have provided a voice to thousands of supporters in Cheltenham. Please come and see us at our Street Stall in town and/or join us at our speaker events and rallies. As a town, Cheltenham voted 56% Remain and most recent polls now put this at 62%. Cheltenham For Europe is a grassroots, cross-party group dedicated to remaining in the European Union. Our current mission is to secure a People’s Vote with the option to Remain. Come and talk to us in town this weekend. You will find us most Saturdays on Cheltenham High Street. We are talking to people about Brexit, listening to their concerns and explaining why we believe that the People’s Vote is the best way forward. Please pop by. 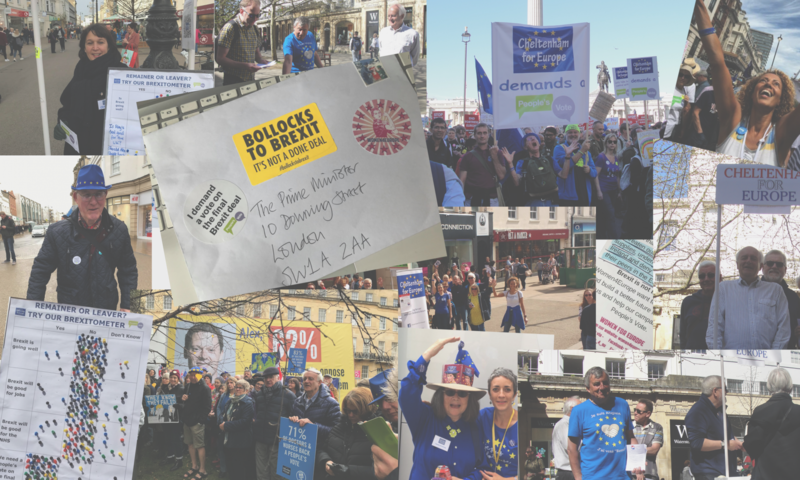 It is all friendly and we post our Street Stall details on Facebook (times and locations), so please click on the link below or look for Chelt4Europe (Public) on Facebook. We often arrange speakers with expertise on Brexit and the EU to come and share their knowledge. Details for these events are posted on Facebook and Twitter, so please follow us via the links below for more information.